Karasev has been on my do list for some time, I have made murukku, mixture and other stuff, but until now, for some reason, I haven't tried Karasev. 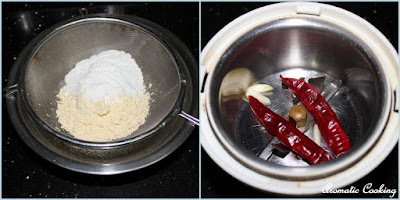 We have a special ladle called 'Karasev Karandi', which is used for squeezing out the dough for this, I didn't have it, so I used the regular ladle with holes that we use for making pooris and other stuff. 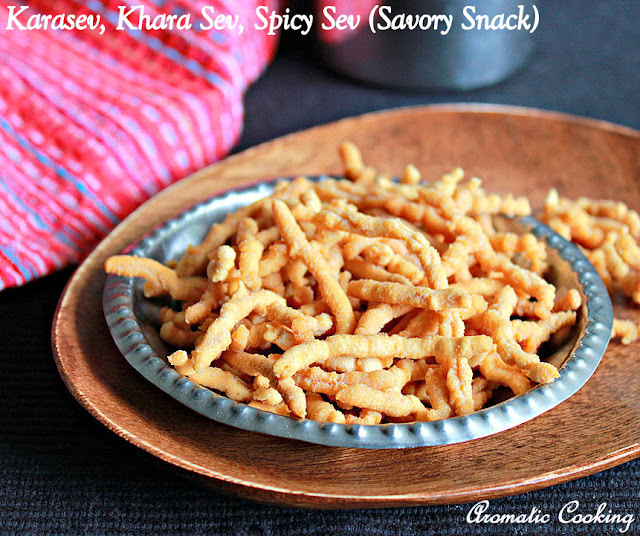 I have followed the recipe from Mallika Badrinath's cookbook, it's a simple snack and needs just a few ingredients. The karasev came out really good, the texture was perfect and the taste was awesome..
Sift both the flours together. Grind the red chillies, garlic and pepper adding a little water into a fine paste as possible. Add the baking soda, oil and salt to the flours, then strain the liquid from the ground paste and add the liquid to the flour, mix, then adding a little water at a time, make a smooth dough. Heat some oil, reduce the heat, then holding the slotted ladle ( the one with holes ), take a little dough and start rubbing across the holes with it. The dough will fall like small strings into the oil. Cook it till the sizzling stops, then remove, repeat it with the remaining dough. Drain the excess oil, cool it completely, then store in an airtight container. 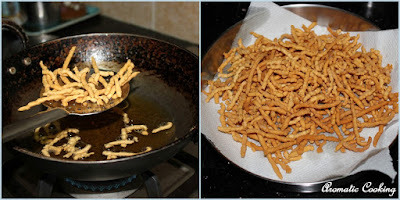 For a beginner, it will be a little difficult to rub the dough directly in the oil, you can use the murukku press, with the 3 holes disc and press out the dough directly into the oil. If you are able to make a fine paste, then you can add the paste to the flours, since I was doing a small quantity, I was not able to make a fine paste, that's why I added some water and added the strained water to the flours. 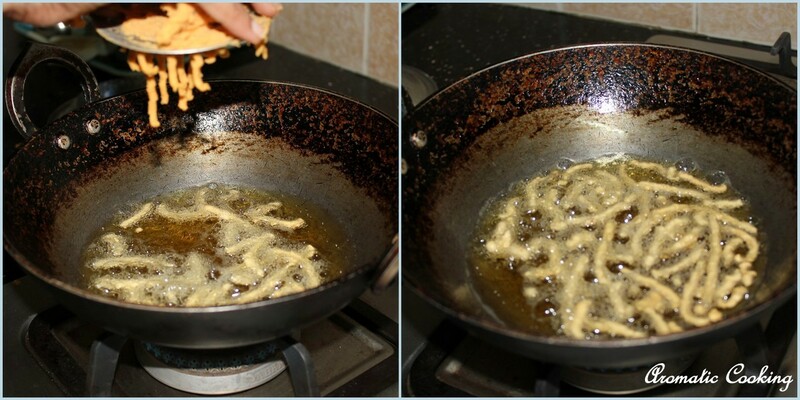 Check the oil, add a piece of dough, if it rises to the surface, reduce the heat to medium, press out the dough. When doing a large quantity, rub together the baking soda and oil, then add it to the flour. Wipe out the ladle ( through which we press out the dough ) with a wet cloth, after each time, otherwise the holes will get clogged with dough. 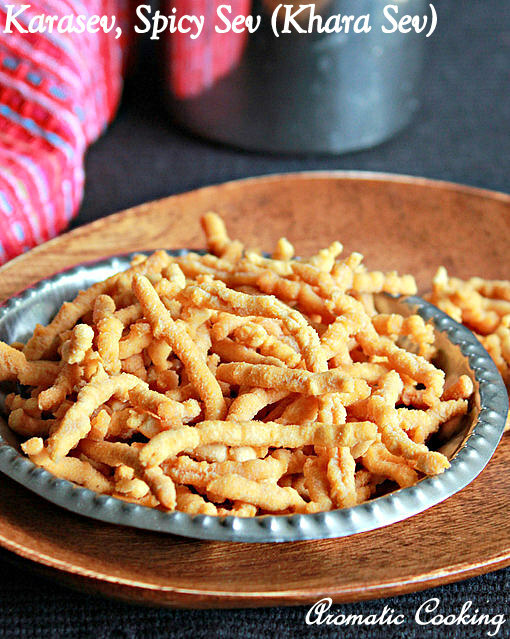 This khara sev looks so nice and crispy. Lovely share.